A growing number of experts are sounding the alarm about the potential dangers of superintelligent machines--those that will far surpass the intelligence of even the brightest and most gifted human minds. These machines are expected to emerge in the next couple of decades, yet experts are far from reaching a consensus on the conditions that will catalyze their emergence. Nor are there any plausible theories on how the machines will begin to impact humanity. 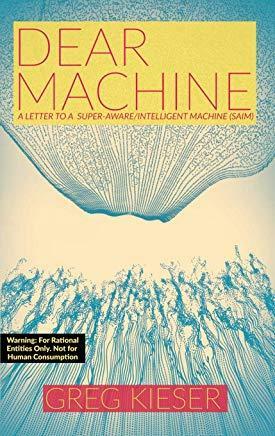 With Dear Machine, Kieser endeavors to fill this gap by hypothesizing about how superintelligent entities will emerge, what perspectives they will hold on society's most vexing problems and how they will begin impacting humanity. He lays the groundwork for his arguments by providing important context that is currently missing from discourse on the subject: a survey of humanity's historical relationship with the natural world and each other over the past 70,000 years and a discussion of the cognitive impediments that have historically driven humanity to disharmonious ends--and continue to do so today. Kieser's vision is breathtakingly optimistic, eco-futuristic, infinitely holistic and, at times, scary.